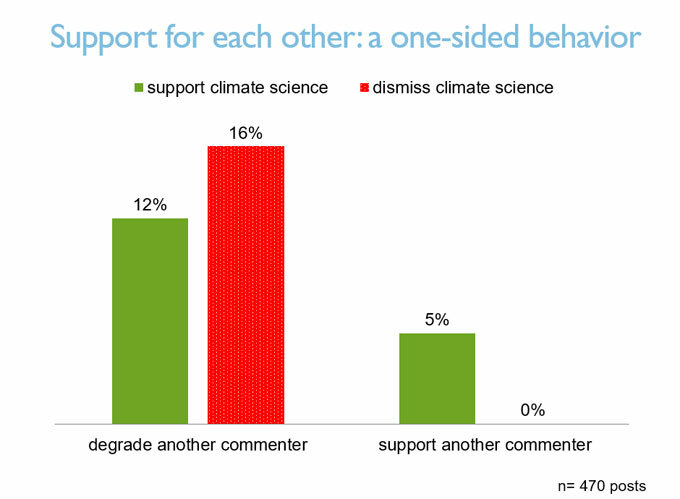 Different messages, tactics, and tone characterize online commenters' climate change posts. Read online comments about news stories or political events, and you’ll undoubtedly notice how quickly things devolve into an all-caps tirade. Why is that? Does bad behavior on one side beget even worse behavior from the other? Is contempt an inevitable component of online disagreement? Curious about how we talk about climate change, I examined hundreds of exchanges of Facebook comments between people who agree with climate science and people who don’t. I read and dissected 600 comments and tabulated data about the type of content posted, the manner in which it was said, and ultimately, if it all fostered a productive conversation. That research took place in early 2016, well before last fall’s elections and the inauguration of President Trump. That timing is important to mention, as the mood of online climate change communications may be different now, and as the national discourse sinks into even deeper polarization and ever-louder echo chambers. The first part of this study found that Facebook comments are more polarized and more dismissive of climate science than overall public views in the U.S. This part of analysis delved into the style and tone of online comments: Do the pro-science and contrarian camps exhibit different behaviors? 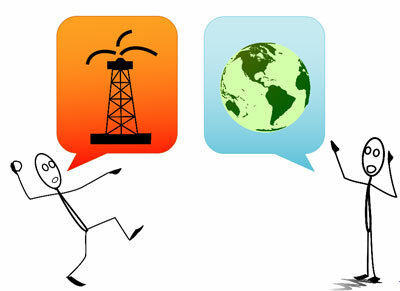 How does the tenor of conversation reflect the online media outlet where it takes place? Let’s first consider the type of content in each comment. Was it a piece of information, like a statement about temperature records, or an argument meant to be persuasive? Or perhaps just a flat-out ad hominem attack? Persuasive arguments topped the list. After all, most people engaging in online exchanges are trying to convince others that their worldview is the better one. 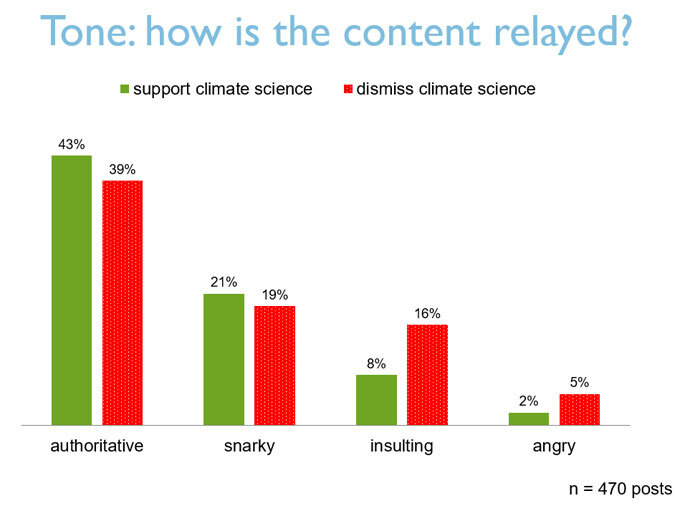 Though users on both sides of the issue used persuasion to make their case, persuasion was more prevalent among those commenters disagreeing with the mainstream climate science. 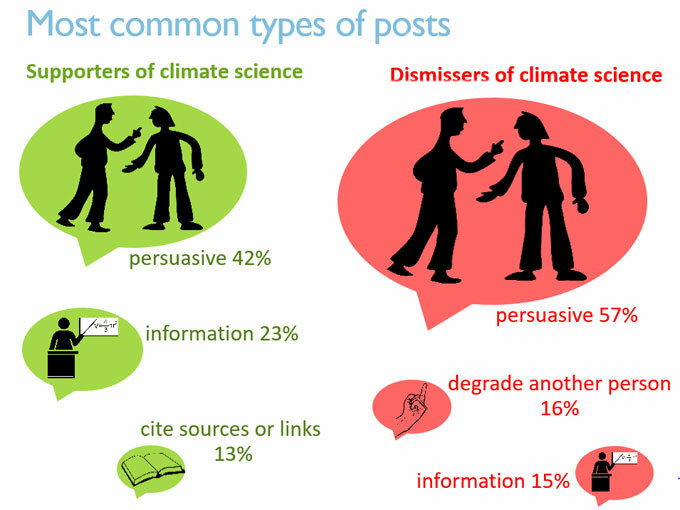 Commenters supporting climate science were more likely to write an informative post, and to cite a reference or post a link. They tossed out insults, but that was not a prevailing strategy. In essence, these commenters showed a clear tendency to educate and inform rather than attack and defame. Not all comments were antagonistic. In some cases a commenter sought just the opposite – to publicly support someone and offer a digital high five. This behavior was not common, but it stood-out in how it was used. Supportive comments were made only by the pro-science users. People who dismissed climate science did not compliment another person, even someone they agreed with. That tendency may shed light on the attitudes people bring to these discussions. Supporters of climate science were inclined to share information and acknowledge others who are on their side. Detractors spent considerable energy attacking their antagonists but none on acknowledging their allies. After tallying what people were saying, I looked at how they said it. Was the tone authoritative, humorous, sarcastic, or mean? As with the content, I disregarded the accuracy of the information and considered only the manner in which it was said. Thus, a comment could be authoritative but also incorrect. Most of the comments had an authoritative tone, in similar proportions for both camps. 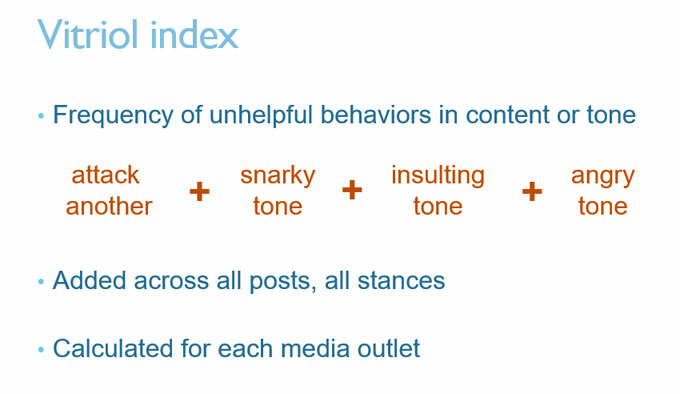 But 30 to 40 percent of all posts had an “uncivil” tone of anger, insults, or snarky condescension. These derogatory behaviors were not equally distributed across all users. Hostile comments were more prevalent from the climate contrarians. Posts with an angry or insulting tone were twice as likely to come from climate dissenters than from those expressing pro-science views. The one measure where the science supporters exhibited worse behavior than their detractors was the snark factor. Sarcastic, condescending comments were slightly more common from the pro-climate side. The difference was slight and not statistically significant, but still warrants a mention. Looking across both the content and the tone of posts, the climate contrarians clearly exhibited less civility in their comments. Science supporters also displayed some unruly behavior, but were more inclined to be informative than insulting. The conversational style had vivid contrasts depending on where it took place. While all of the comments analyzed were posted on Facebook, they were posted at six different Facebook pages. Four were media companies and two were science agencies. To characterize the type of conversation on different pages, I devised the Vitriol Index, which sums up all the unhelpful behaviors across all of the comments made in a given conversation. 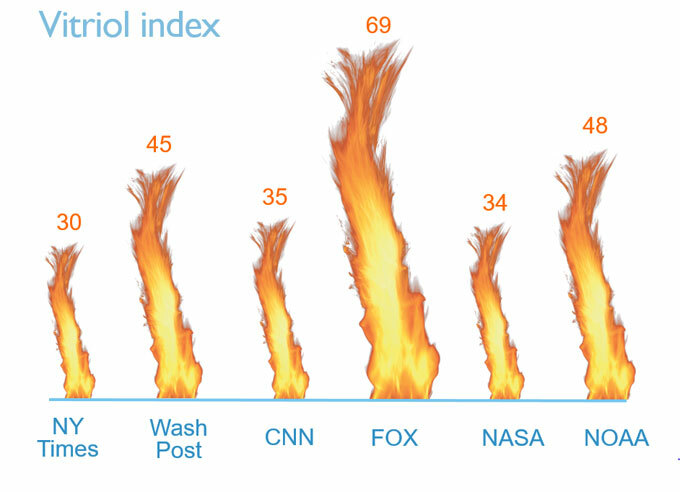 Then I compared the vitriol score among different Facebook pages. The Fox News comments had 69 instances of incivility in 100 posts, which illustrates the virulent mood of the conversation. What’s intriguing though, is that the Fox News comments expressed about the most widespread agreement compared to the other discussions I measured. The majority of Fox commenters were already in alignment with each other, yet they yelled louder than anywhere else. With this example, we can see that the discord around contentious issues like climate change isn’t stoked just by disagreement: It’s also driven by reinforcement of tribal attitudes, repetition of rhetoric, and normalization of uncivil behaviors. The Fox News comments feed had other contrasts too. For one thing, the comments came in rapidly; the first 100 comments were posted in less than an hour. Posts were exchanged so quickly that there was little time for reflection or an exchange of ideas. In about 20 percent of the posts, I could not discern what the author’s message was intended to be. The angry tone was patently clear, but the content lacked an identifiable point. A few, brave souls attempted to offer a dissenting view that climate science is legitimate, and these people suffered abuse from multiple commenters. This environment was vastly different from that of the others, and offered a troubling glimpse into the discourse at one of our country’s most popular media outlets. 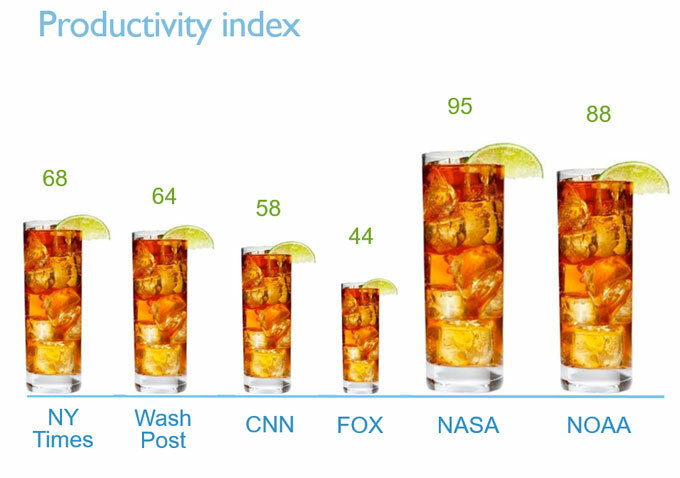 Is there any hope for a productive discourse? Yes. Even in the most heated conversations, there were comments that brought up useful, factual ideas and shared them in a constructive manner. I added up all these helpful behaviors to reveal where the conversation was characterized by informative posts, referenced sources, and supportive rather than inflammatory comments. We can see that the NASA and NOAA Facebook pages fostered the most constructive commenting behaviors. These exchanges were not necessarily ones in which everyone agreed; nonetheless ideas and opinions were exchanged in an informative way. Examples like this show that it’s possible to disagree while still maintaining basic social order. The discourse at Fox shows that it’s also possible to agree in an uncivil way. By the way, there was no evidence that any of these commenters softened their stance on climate change. Such transformations can occur, but none did in the sample captured here. Like rain in the desert, a change in someone’s outlook is possible, yet rare. Looking back through the hundreds of exchanges, a few takeaways resonate. While the possibility of changing someone’s mind is small, the conversation is energetic and impassioned on both sides. Ultimately, the quality of conversation hinges not on whether we agree, but on how we conduct ourselves. As American society faces bitter polarization across many issues, it’s increasingly important that we learn to disagree constructively. The alternative is as ugly and unproductive as a schoolyard fistfight. And in the meantime, Earth’s atmosphere will not wait around for us to iron out our differences. Editor’s Note: This work benefited from the author’s collaboration with John Cook, PhD, of George Mason University, who is the founder of the Skeptical Science website, which focuses on understanding and responding to comments dismissive of climate science.